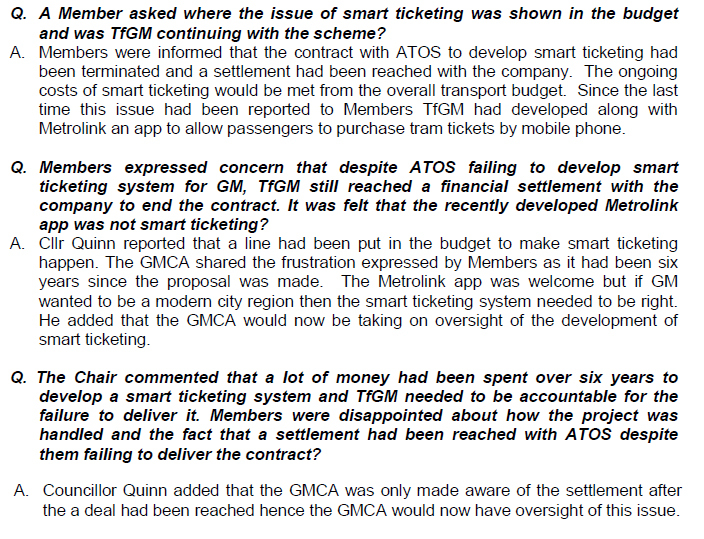 After six years of squandering public money on the development of a Greater Manchester smart ticketing system which they failed to deliver ATOS have received a financial settlement from Transport for Greater Manchester. The incompetent Greater Manchester Combined Authority who fund TFGM from member authority contributions which includes Oldham say they only found out about the settlement deal after it was done. The original budget for this scheme was £16.4 million most of which was to be funded by prudential borrowing. Jim McMahon had been lead member for transport at GMCA for some time before becoming an MP but I am quite sure he will distance himself for any accountability or lack of prudent monitoring. None of this bodes well for Greater Manchester when the the combined authority starts to have control of devolution finances especially in light of the revelation in 2015 that the Labour Party briefed ATOS on their plans for government.